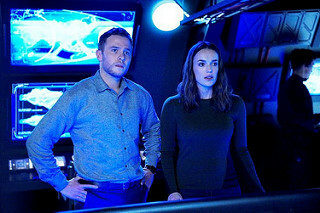 EPISODE EIGHT, SEASON FOUR- "THE LAWS OF INFERNO DYNAMICS"
As I have observed the last three and half (roughly) seasons of "Agents of S.H.I.E.L.D." I have spoken immensely about the missed opportunities the show displays and how most seasons feature a storytelling dud in the wake. During season two, the show introduced two great, new characters; Mockingbird and Lance Hunter. There was a tease they would be leaving S.H.I.E.L.D. at the end of the season, which never panned out, because they were so popular. Then near the end of season three, ABC decided they really liked the idea of a Mockingbird/Hunter spin-off series, so they took the two most popular new characters out of the show...then never made their spin-off. Also, in the third season, the show planned to introduce The Secret Warriors, a team of Inhumans. But they only assembled for one episode; then one character left, another died, another went rogue and the whole team was scrapped. Deathlokk is nowhere to be found, Patton Oswald's character(s) are nowhere to be found and more and more, the show teases us with a new direction, then immediately squanders it for more familiarity. The introduction of Ghost Rider may have been a random way to keep the show alive during its new time spot, which is rumored to be a death bed time slot for most shows, but ended up different. The inclusion of Ghost Rider gave us an edgier, darker and much different show then I ever would have thought possible, and I have to say, that I quite enjoyed this new direction. Things got weird and strange and it showed audience not in tuned with the comics just how deep S.H.I.E.L.D. will go to keep our world safe. So wouldn't you know, only eight episodes into this fourth season, Ghost Rider is no more. Oh sure, Coulson casually addresses that we may see him again. But after throwing "Most Wanted" off production and completely dismantling The Secret Warriors and introducing Gravitron one episode in season one then NEVER coming back to him, I won't be holding my breath. It almost feels like "Agents of S.H.I.E.L.D." is unwilling to become anything more than slightly-strange, superpowered spy show. Why are they so afraid to be different when viewers are falling off the map? Not to mention that Robbie Reyes was a welcome addition to the show and the acting work done by Gabriel Luna has been remarkable from get-go. I never knew of the man before this, but I think he's a fine actor and I sincerely hope to see him again. But as far as we know, Eli Marrow turned bad, he got himself some wicked superpowers, and he created a terrible weapon from all the dimensions he's been playing around with. Robbie stops him (only to fall in the same dimension Eli went) with the help of Aida. Then here's the thing...Aida slips into madness. Of course, we saw this coming. After what we witness last week, of course Aida was going to turn bad. Right before the credits roll, we learn that the Agent May with Coulson and team isn't the real agent May. The real agent May is being held prisoner by Aida and her Life Model Decoy of May that she made is with the team. Launching a whole new storyline when we pick up this show in January. Much like ABC's "Once Upon A Time," AMC's "The Walking Dead," and Fox's "Gotham," it looks like we will be getting a new story in between seasonal breaks. Its cool I guess, but it just feels like two whole seasons mashed together. Sure, it features a lot less filler than what "The Flash" and "Arrow" do, but I wish ABC would take a play from their brothers at Netflix and just do ONE story line of thirteen episodes a season. That would have given us good time to really get to know Ghost Rider, his story line seems to zip-line through eight episodes, and then he vanishes without a trace. This first half featured other dimensions and ghosts, now in January we are getting the ABC version of Ultron (Which Director Mace went out of his way to name drop tonight). But hey, Daisy/Quake has been accepted by the public once its clear that she is a S.H.I.E.L.D. agent and the team comes together soundly. Of course, we saw that coming too. I am starting to feel this show is wanting to have too much in common with the movies of the Marvel Cinematic Universe, they are in such a rush to put a happy ending bow on their stories that they forget to keep stakes for the characters. What's the point of Daisy even going rogue when it all gets cleared up in a matter of four or so episodes? Where is all the drama? What I liked about "Luke Cage" and the second season of "Daredevil" over at Netflix is that not all of the threads get a happy closure. Where we find the characters at the end of those shows in still in limbo. It'd be nice if "Agents of S.H.I.E.L.D." kept us hanging every once in awhile. And no, I don't know how excited I am for Yo-Yo web-series. For starters, I feel like we barely know her. She's barely been fleshed out as a character. When she is onscreen, she barely sticks out. Her scenes in this finale where she is running in slow motion feel like Quicksilver rip-off scenes. And I am not talking about MCU Quicksilver, but the X-Men Quicksilver. I belong to a Marvel group on Facebook, and those Yo-Yo, slo-mo scenes fell the flattest last night. The big Quake, Ghost Rider, Yo-Yo team-up just didn't crash down on the hype train like we hoped for. I feel Yo-Yo's scenes in particular seemed to fall the flattest. Now they want us to care about a web-series? Just because she's banging Mack doesn't mean I am all of sudden going to care about her. Yo-Yo feels kind of like Ward to me, a character ABC no longer knows what to do with. I will say, I loved Director Mace's suit though, that was kind of cool, though underused. Sadly, "Agents of S.H.I.E.L.D." is, once again, slipping back into their old ways. And after taking a chance on something new, that's a bit of a disappointment. What did the rest of you think? Wanna see "Why Him?" I say Why Not?